It's shameful that the United States is no better than Indonesia. 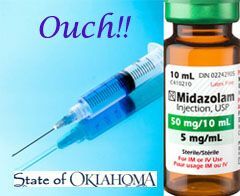 Oklahoma resumed executions yesterday after the brutal, botched execution of Clayton Lockett. Details here. Oklahoma officials question whether that was true because his body didn't move. Most likely, his body couldn't move because the first drug they injected paralyzed him. You wouldn't do a dog this way. Many states have laws banning the use of paralytics in animal euthanasia. Here's a 2006 Human Rights Watch report, So Long As They Die. Anyone remember Stan "Tookie" Williams? He was executed in 2005. It took the medical technician 11 minutes to find a vein, prompting him to say, "You sure you doing this right?" Read this chilling report of his execution, which took 36 minutes. It's 10 years later and like Indonesia, we are still committing state-sanctioned murder in a wanton and cruel manner. This isn't justice, it's barbarism. In the U.S. the purpose is vengeance, which is not an acceptable purpose of punishment. 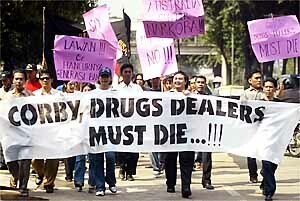 In Indonesia, officials rigidly insist on following the country's inhumane law, claiming drug trafficking is such an insidious crime, death is warranted. When ISIS cuts off the hand of a thief for stealing, or beheads a spy, or stones a woman for adultery, all of which are crimes and prescribed punishments under the law it follows, the whole world recoils in horror. When Indonesia armed forces tie a group of non-violent criminal offenders to a wooden cross, shoot them, and then stand around watching them writhe on the ground until they're dead, the world just nods and moves on to the next story. We can't boycott the U.S. because we live here. Our only recourse is to vote officials who support capital punishment out of office and replace them with candidates who pledge to change the law. Neither we, nor citizens of Europe and other countries where the death penalty is banned, have an electoral say in the affairs of Indonesia. But we have tourist dollars. Fiji, the Seychelles and Mauritius have beautiful beaches. If you want an island beach vacation, there are many options besides Bali and Indonesia. Go to Hawaii. Visit Donald on Oahu or Volcanoes National Park on the Big Island, or anywhere else but Bali. stop going to Bali for one of the best waves ever. Sad to say. has a conveyor belt to Bali. 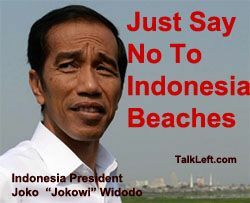 The Aussies should boycott Bali. That would really make a difference. cross, a symbol of Christianity? The CIA Factbook may contain the reason. I'd guess that the reason is more practical than symbolic. People tied to a post would tend to slide downward, complicating the "work" of the bullet-pushers. as a method of execution long before Christ was crucified. Crucifixion (or impalement), in one form or another, was used by Persians, Carthaginians, Macedonians, and Romans. Death was often hastened. "The attending Roman guards could only leave the site after the victim had died, and were known to precipitate death by means of deliberate fracturing of the tibia and/or fibula, spear stab wounds into the heart, sharp blows to the front of the chest, or a smoking fire built at the foot of the cross to asphyxiate the victim." Granted, the cross was used back then as the method of execution itself, not as something to attach someone to while they were killed by bullets (which, of course, didn't exist then), or, say, arrows or spears or stoning. But use of the cross in executions certainly pre-dates it's importance as a symbol of Christianity. utilitarian structure then. No big deal. about this in the first place, since it was easy enough to Google? post "tied to a wooden cross." I gathered Jeralyn thinks the use of crosses is significant. that if the people were chained to a wall and then shot, Jeralyn's headline would have been "Chained to a wall." Don't have a problem with mentioning it in the story, but it was the headline and didn't have much to do with the post. It was meant as more than just information IMO, it was provocative. I though the thread was going to be about being tied to a cross, it wasn't, more of an appeal to not spend money in Bali/Indonesia. The condemned said "It feels like acid" and "My body is on fire" before any of the drugs were administered. In fact, the article you linked to says that too. As a criminal sentence in the 21st century, capital punishment is a modern-day barbarity. Its sole purpose is nothing more than selective vengeance, because its imposition is entirely subjective and the executions themselves are carried out in a completely haphazard and arbitrary fashion. Further, capital punishment neither restores the victims of the convicted to life, nor does it once again make whole the respective families of those victims. And finally, there is clear evidence that the sentence has been wrongly imposed and in some instances likely inflicted upon people who've actually been innocent -- which at the very least is felony manslaughter, should anyone ever care to step up and take responsibility for their negligence and error. So again, what's your point here? It makes for a good story, but spreading falsehoods without regard for whether it is true or not will undermine your cause. The guy (who, I note, raped and murdered an infant) was putting on a show in the vain hope of getting his execution stopped. And, for what it's worth, the government punishes innocent people all the time. It's part of the system. What's the old axiom--that it's better to let ten guilty men go free than to punish one innocent? If that's the metric, we're doing pretty good. Also, death penalty cases get far, far more scrutiny from the courts than other prosecutions. I can say with confidence that the error rate is much lower. As perverse as it sounds, if you're wrongly accused of a murder, you'd get a more thorough defense and fairer trial than if the prosecution was "just" seeking to put you away forever. But if you abolish the death penalty, will those same resources be devoted to vetting other prosecutions? Fat chance! That money's going to medicaid. ...of a 14 year old boy that was executed. So who exactly would the control group be for determining if the drugs used indeed, "It feels like acid" and "My body is on fire" ? That would require someone with unimpeachable character to be given the same drug cocktail used in executions, which seems unlikely. What is an acceptable error rate when killing innocent people ? 1 in 10, 1 in 100, where would you draw the line. And I while it's notable that you are happy the rate is lower, I would imagine the dead guy who did not commit the crime might value one as way too high an error rate. And unfortunately that has already happened, and to a child. Society should not spend it's time figuring out how to humanely kill people, period. It not healthy for society, and doesn't, in any way undo the crime. Life in prison accomplishes the same result, keeping people who operate outside the acceptable law of society, from society. I am not opposed to the death penalty in theory, but the problem is administered by a very flawed species whose justice system often operates around individual needs that justice for the society. I was watching Dr Who, a bad guy had just shot the Doctor's daughter, he walked over an grabbed the gun and pointed it to the bad guy's head and said "I will never do this", and tossed the gun. That is how as a society whose criminal justice system is not meant to be retaliatory, aka an eye for an eye. We shouldn't sink to their level to distribute justice, we are better than capital murderers, or rather we should strive to be. Because, I would reiterate, the guy said those things before any of the drugs were administered. It was an act, but he jumped the gun after they hooked up the saline IV. I'm sure he was hoping they'd stop the execution like they tried to do last time. It was worth a shot, I bet. "Beyond a reasonable doubt" is not reducible to a number, but it's below absolute certainty. In death penalty cases the process is far more rigorous, but errors are still inevitable. But I'm not convinced there's a serious moral difference between locking someone up forever and executing them. The practical question would be this: would it be better to lock up 1+x innocent men for life than to execute one? ... the more important question is "Why kill them when you don't have to ? ", it's gratuitous and you admit there is an error factor. One dead innocent person is certainly worse than none. I agree about the moral difference, but I also stated that I don't have a moral objection to the death sentence. If it were me, the few minutes of pain would be preferred to a lifetime in prison because you are most likely to suffer a lonely and painful death with little medical care. That to me is what hell would be like if I believed in such things, suffering all alone when you are your most vulnerable. Getting off topic on something we probably will never be in agreement on. It's one thing to kill someone who committed a capital crime, it's quite another to kill people who transport goods other people really like and want. That is insane, and simply an extreme version of our own War on Drugs, vilifying something in high demand for the sole purpose of trying to stop it. I would understand, not agree, if it worked, but I mean seriously, anyone who wants drugs can get them in the US. All the War is doing is driving up the price and esculating the violence.